Converts selected pasted "Copied Paths" into file hyperlinks. 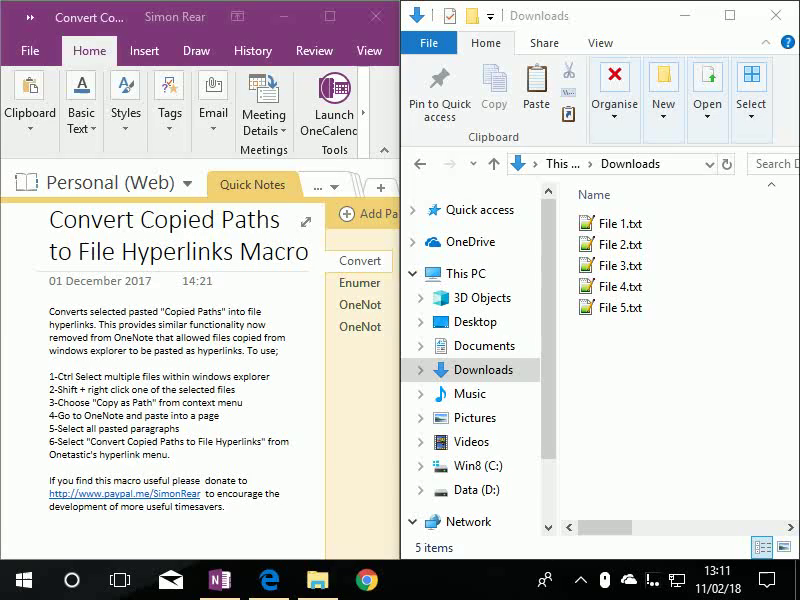 This provides similar functionality now removed from OneNote that allowed files copied from windows explorer to be pasted as hyperlinks. To use; 1-Ctrl Select multiple files within windows explorer, 2-Shift + right click one of the selected files, 3-Choose "Copy as Path" from context menu, 4-Go to OneNote and paste into a page, 5-Select all pasted paragraphs, 6-Select "Convert Copied Paths to File Hyperlinks" from Onetastic's hyperlink menu. See a demo of the macro in action at https://youtu.be/22nMT8wy8Cc. If you find this macro useful please donate to http://www.paypal.me/SimonRear to encourage the development of more useful timesavers. Previous macro version had double backslashes stripped out after upload for some reason introducing a bug preventing macro from working. This version corrects this. Macro now also converts inline copied paths preserving any text before and after the copied path within the selected paragraph(s). Is there a macro that will split window (like Word). Unfortunately, the "new window" that is current in OneNote has synchronized to the first window such that the second window is not stationary. Difficult to use the second window as a reference. Hi RGreen, could be persuaded to develop a macro for you that does this if you are willing to make a donation for my time, it's precious :-). after the update the macro works like a charm for me, thanks! How about implementing a function to convert it back into a full path again? Hi RGreen I have tried installing a German language pack, setting it as default language and macro still works for me. Can I suggest you turn on Macro Logging from the Onetastic settings menu, then run the macro again, (repeating the process you outlined below to try and covert a path). This should create a log file called "macroLog.txt" in folder "C:\Users\[Your User Name]\AppData\Roaming\Onetastic ". Please upload the log file to a file sharing site like google drive or one drive and post a public link here so I can inspect it? (I'd rather not post my private email address on a public site.) Maybe this will give us a clue as to what is going on. 1. copied the path of an existing file (no special characters, no spaces in file e.g. "C:\Intel\Logs\IntelGFXCoin.log"
3. selected paragraph and selected macro: still the same result. When I select the macro, a small dialog box appears for a split second and then disappears without doing anything. Did you test it with different application language settings? This is how they appear when I select files from windows explorer, then press shift and right click and select [Copy as Path] and finally paste into one note. You also need to ensure you have selected paragraphs or at least have the cursor on the line of the one you want to convert. The Macro identifies folder paths using the quotes and backslashes. If they are not present the macro will not do anything. Let me know how you get on. Don't forget you can see macro in action by visiting my YouTube channel in macro description. Thanks for trying out the macro! Nice idea. It somehow doesn't work for me, though, i.e. after selecting the inserted path(s) and choosing the macro, nothing happens. I have OneNote 2016 with German language settings.